Work on the London Underground at Hobbs End is halted when a strange, dwarf-like skeleton is found. Scientists are called in, headed by Dr Roney, and further diggings reveal something metallic buried in the mud. Thinking it to be an unexploded wartime bomb, Roney informs the Ministry of Defence and Professor Quatermass and Colonel Breen inspect the object. Breen is convinced that the thing is a German secret weapon, but Quatermass suspects something far more sinister. Given the history of the area, where for centuries sightings of ‘demons’ have been reported, he believes that forces from another world have been at work – forces which could still wreak havoc! 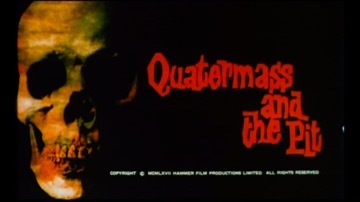 This was Roy Ward Baker’s first film for Hammer, the others are “The Anniversary” (1968), “Moon Zero Two” (1969), “The Vampire Lovers” (1970), “Scars of Dracula” (1970), “Dr Jekyll and Sister Hyde” (1971) and “The Legend of the 7 Golden Vampires” (1974). For rivals Amicus, he directed “Asylum” (1972), “…and now the Screaming Starts” (1973) and “The Vault of Horror” (1973). His other work includes “The Monster Club” (1980, with Vincent Price and John Carradine).